The rise and fall of empires has a topical side to it, given today’s military and political conflicts. Perhaps this is just one of the reasons why the British Museum’s current exhibition, Forgotten Empire, is drawing record numbers of visitors. 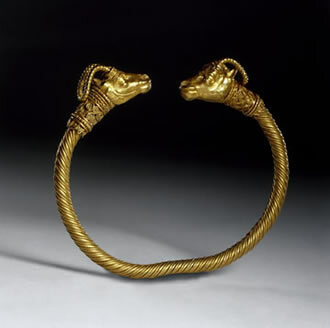 Gold bracelet with ibex head terminals. From Pasargadae. Not that many references to today’s world appear in the show - on the contrary, the most spectacular artefacts on display are 2,500 years old. Nonetheless, there is a contemporary relevance. The Persian empire was perhaps the first truly globalising political and economic power in history. Cyrus the Great and his armies invaded Asia Minor from the east, capturing Babylon (but not by military force) in 536BC. Soon after Darius I conquered Egypt. Thus two great civilisations fell to Persian cavalry and ended up paying tribute to Persian kings. For 220 years, they ruled over an empire that dominated the eastern Mediterranean, including Libya, and extended to the Indus river and central Asia, taking in a total of three million square miles. A glimpse of the lavish royal palaces in cities like Persepolis, Pasargadae and Susa is provided by dramatically-lit casts, original architectural fragments and sculpted figures. Golden jewellery and drinking vessels show the extraordinary luxury afforded by the massive tribute paid to the King of Kings, Cyrus and his followers. Stone relief showing gift-bearers with a vase. From Persepolis. At first, the stiff figures in ceremonial processions are reminiscent of the Babylonians and Assyrians who inhabited what is today’s Iraq – and who are more familiar to us from the British Museum’s own collection. The micro-sculptures of cylinder seals, for example, were not a Persian invention. But as with the larger images, a separate identity begins to emerge. Inscriptions are often in a variety of languages such as Old Persian, Elamite and Babylonian and even hieroglyphics. There are recurrent fashions in dress and winged griffins, as well as mythological figures and symbols. The Persian empire was contemporary with the much smaller kingdoms and city-republics of ancient Greece. Due to the invention of history writing by the rival Greeks, western views of the Persians have been heavily skewed. In an essay on the administration of the Achaemenid (the original royal dynasty) empire, Andrew Meadows of the British Museum contrasts the two powers. Thanks to Greek writers like Herodotus and Xenophon, the way in which the Persians organised their vast territory is recorded. It was divided into satrapies (the origin of the English word satrap is Persian). Each of these had a representative or governor who had to organise the sending of tribute back to the king of kings. Demands for money were backed up by military force. But the longevity of Persian rule was due not only to ruthless armies, but to structural flexibility and tolerance of different cultures. Lapis Lazuli head of a statue. From Persepolis. The exhibition brings to vivid life the struggles and interactions between the Persians and Greeks in many different ways. One tiny stamp seal, for example, shows a Persian soldier aiming a spear at a Greek hoplite soldier wearing a helmet and kilt. On a larger scale, a vase from Libya shows a Persian warrior attacking a young Greek. A cultural cross-over appears on a marvellously preserved vase Athenian plate found in central Italy, showing a female archer wearing Persian (Median) costume. 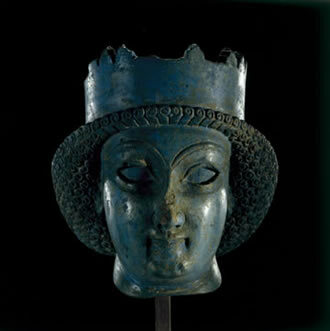 In bringing together these artefacts from Iran, France and Britain and their interpretation by an impressive international group of curators, a truly dynamic and new view of the achievements of ancient Persia can be formed. It should reshape our view, not only of the distant past, but also of the present. 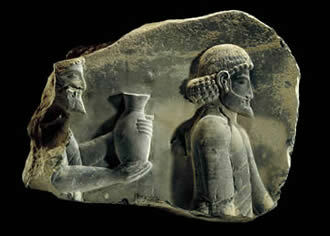 Forgotten Empire: the world of ancient Persia is at the British Museum until January 2006.